Pasonomi is a US REGISTERED TRADEMARK, producing a full line of accessories for all Apple products, Samsung phones and tablets. LG and Google tablets accessories etc. High quality, fast shipping, good customer service, Pasonomi is your best choice! Only compatible with Samsung Galaxy Note 9, does not compatible with any other cellphones! 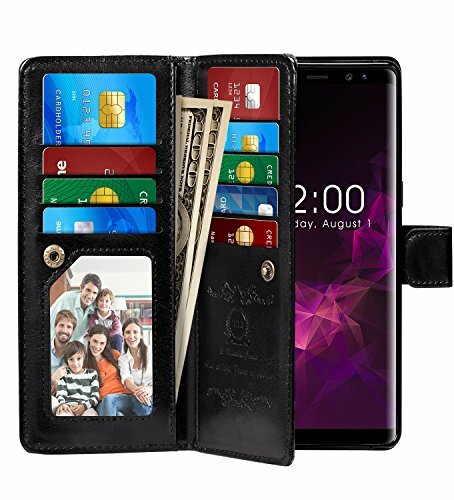 - 1 x (2 in 1) PU leather case for Samsung Galaxy Note 9 ; Phone not included. PERFECT FIT for Samsung Galaxy Note 9. Material: high quality PU Leather, Magnets and PC, non-toxic and environmentally friendly. 9 Card Slots for credit card, ID or cash, 1 with view window can place your favorite photo. The most card slot designed case on the market, with wriststrap for easy carrying, removable design to conveniently anwser phone. 360 PROTECTION - Provides excellent protection and prevents scratches, finger print, dirt and daily wear and tear from accumulating.